Having a themed birthday party? Hosting your celebration at a special location? You've got to have the invites to fit the part! 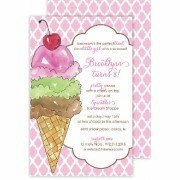 Whether you're hosting the festivities at a roller rink or celebrating with a sophisticated dinner party, we've got birthday invitations for any type of party. Remind your guests to keep a surprise party a secret with our special surprise birthday invitations, or remember your child's first years with personalized photo invitations. You want to make sure that you choose a card that catches the guest's eyes and serves as a daily reminder. Our wide selection makes that easy! Shop the different categories below and let us help you find exactly what you need.